Are you tracking carbs but missing your lunchtime sandwich? 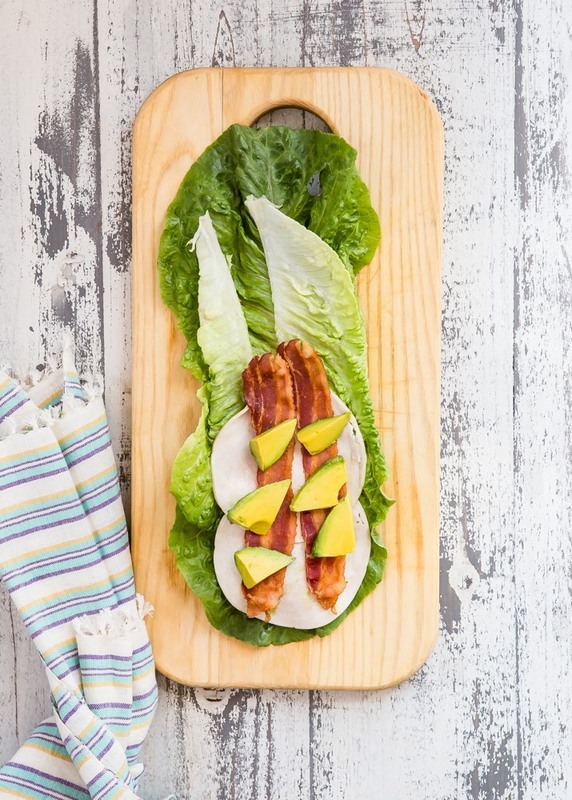 Turkey Club Lettuce Wraps are here to satisfy all your low-carb sandwich cravings! 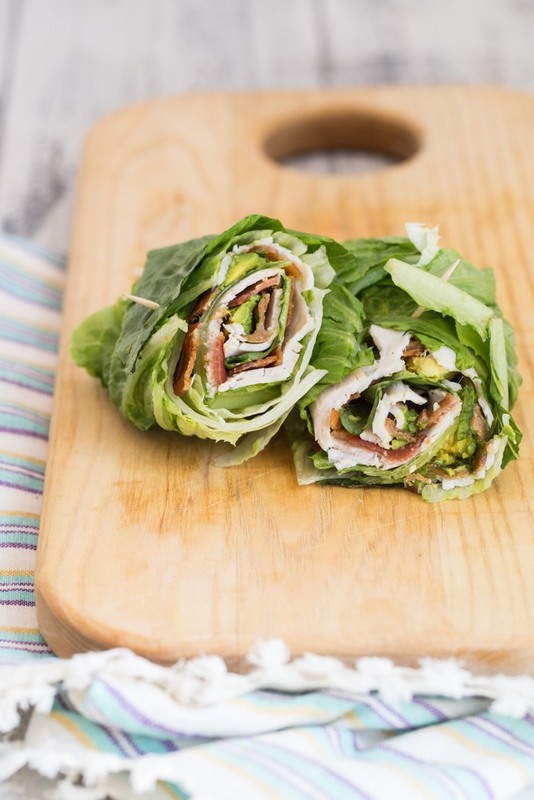 Romaine lettuce is hearty and the leaves are large so it is the perfect think to wrap up all your favorite ingredients into a bread-less sandwich. In this Turkey Club Lettuce Wrap I kept it simple with deli turkey meat, bacon, and avocado. You can definitely add tomatoes, cheese, salsa, mayonnaise, or whatever other toppings you love. Serve this in your school or office lunchbox with berries, red bell peppers with hummus, and a brownie for a completely gluten-free meal! What else would you add to this wrap?! 1. Remove the stem from the romaine leaves. Lay 1 romaine leaf on a flat surface, and lay 1 more leaf on top in the opposite direction. This will be your wrap or "bread". 2. Layer 2 slices of turkey, 2 slices of bacon, and 1/4 of the sliced avocado. If your bacon is too crispy, you can crumble it to make rolling the wrap easier. 3. Roll up into a spiral and cut in half. Repeat with remaining ingredients to make 4 wraps. 4. Secure with a toothpick to keep closed if necessary, or lay seam-side down in the lunchbox or on a plate. Or his email: [email protected] he will help you. Interesting recipe but the comment section is out of control, all these garbage comments that have nothing to do with this site need to go. My life is full of happiness because Dr Uzoya make me to be happy. What happened to me is not what i can keep only to myself but to also tell the world so that those that were once like me will get their love ones back and been happy once again. I and my lover had some issues which leads to our break up, since after then my life has never been the same, i tried all method to get him back. but they were just waste of effort and waste of time. But one day during my search on the internet, i came across someone testimony about Dr Uzoya. i contact him and explain my problem to him am still very much surprise till now how he was able to bring back my lover within 48 hours. With this great thing that happened in my life i decided to tell the whole world about this great man called Dr Uzoya. For those in need of anything he told me that in his temple there is know impossibility now i believe him so much. friends, if you need help to bring back your ex lover kindly contact him via email; [email protected] and his mobile number +1(301)909-8775 And i promise you that your lover will definitely come back to you. A POWERFUL LOVE SPELL CASTER Dr,Abaka HE SPECIALIZES IN RESTORING BROKEN MARRIAGES CONTACT HIM DIRECTLY ON HIS EMAIL OR WEBSITE (Https://drabakaspelltemple.blogspot.com direct address [email protected])..What else can i say rather than to thank Dr, Abaka who God used to reunite my marriage. Each day of my life, i ask God to bless Dr,Abaka for he has made my life complete by bringing back my wife to me and for this reason, i made a vow to my self that i will testify on the internet to let the world know that Dr, Abaka is a God on Earth. My wife and i had a fight for three days which led to our divorce. On this faithful day, i came across a testimony of how Dr,Abaka helped a lady in getting back her lover. So, i contacted him and explained to him and he told me that my days of sorrows are over that my wife will come back to me within 48 hours for he's going to prepare a spell for me. Could you believe it, my wife came home begging that she needs me back. Do you need any kind of help? Contact; ([email protected]) OR call his phone number via +2349063230051. For the past 2 years now I have been looking for good and genuine spell caster to bring back my ex lover back and also help me to win lottery,and it has been a hard time for me finding the right place until I get in contact with Dr Oseiboh who gave me powerful prayer and assured me that it will take two days before the spell will be effective,unbelievable the next two days i got a call from unknown number so i decided to pick the call the next thing i could hear was my love voice she was pleading and begging me on the phone that i should forgive her that i should forget all that have happened that she did not know what came over her,she promised not to leave for any reason, that she was really sorry for what she did,i was so surprised because i never believed that this could happen,so that was how i accepted her apology the next morning she came to my house and still pleading for me to forgive her i told her that everything is okay that i have forgiven her from my heart, that was how we started again, we are together now. thank you Dr Oseiboh for making her to know that we are meet to be together and also making my dreams to come true. And he did a spell that make me to win the lottery, Please if any body needs. LOVE SPELL,LOTTERY,PREGNANCY SPELL, DIVORCE SPELL,ANY FOUNDATION COURSES,REVENGE SPELL,STOP COURT CASE AND WIN ANY COURT PROBLEM,DEATH SPELL,BUSINESS SPELL AND MANY MORE YOU MAY NEED. Email him now for your own help. via email [email protected] https://droseiboh12.wixsite.com/spelladd him on whatsapp line or call +2347017565415.All thanks goes to Dr oseiboh for the excessive work that he has done for me. Thank you Dr.Ogudugu for the great work you did for me when my lover broke my heart. Dr.Ogudugu was able to bring my lover that left for about 2 months back to me within 48 hours of me contact Dr.Ogudugu. Contact Dr.Ogudugu on [email protected] or better still you can give Dr.Ogudugu a call onWhatsApp +27663492930 for a better understanding for what i just said about him..
Hello, I just wanted to mention I have not had an outbreak of HSV 2 for almost 3 years now (since the first year I got it). When I first contacted it (did go to doctor and got confirmed) I had a couple outbreaks that year (very painful) and then no outbreaks ever again. Like I said it has been almost tow years. The only thing I can think I did was I used essential oil applications on my sacrum. I did take anti viral meds the doctor gave me for a couple weeks after the first outbreak to take care of the acute symptoms (I didn’t take them for the 2nd outbreak later that year and now this happened in my life I can’t believe this. A great testimony that i must share to all HERPES SIMPLEX VIRUS patient in the world i never believed that there could be any complete cure for Herpes or any cure for herpes,i saw people’s testimony on blog sites of how Dr.adeola herbal cure and sent to them and they were cured. i had to try it too and you can,t believe that in just few weeks i started using it all my pains stop gradually and i had to leave without the herpes the doctor gave to me. Right now i can tell you that few months now i have not had any pain, and i have just went for text last week and the doctor confirmed that there is no trace of any herpes on my system. Glory be to God for leading me to this genuine Dr.adeola I am so happy as i am sharing this testimony. My advice to you all who thinks that there is no cure for herpes that is Not true, Here is his Email [email protected] OR whatsapp him on +2349027752454...OR inbox me on whatapp on +1 (758) 284-1397. Every time i take a look back at what had happened to me i will always appreciate the great dr Adoda (www.dradodalovetemple.com) for what he has done for me. This spell caster brought back my finance, who left me just for no reason. I met the great spell caster and he told me all i need to do! Now am glad Dr Adoda brought him back and he love me more than he used to! you can also contact him on his active Email address ( [email protected] ) or add him on Whats-app: +2348112825421. How I Get My Ex Back! Thanks to Dr. Okuns, Who Help Me Bring Back My Ex Love! you are really a great spell caster, that have the solution for any type of marriage problems. I advice You Everyone, Do You Need Your Ex Lover Back? Do You Need Strong Love? Do you Need A Child? OR You Need A Divorce? Dr. Okuns can help you out. Contact him via E-mail: [email protected] for any types of relationship solutions or WhatsApp/Call his phone number: +2348078467513 He also cure any types of Disease.